A very efficient concept of the organiser, musicologist Bianca Țiplea-Temeș – head of the Transylvania Art and Science Association -, who gave intensity and respite for reflection to the participants of the Ligeti Festival 2018, held in the localities of youth, respectively, of birth of the composer, Cluj and Târnăveni. The first two days of the Festival were dedicated to the musicology conference on the topic Ligeti: a Portrait with Reich and Riley. The keynote speech of Kofi Agawu (Princeton University) set some sound parallels between African traditional music and Ligeti, concluding that "the force of individual compositional labour transcends the peculiarities of a composer’s material". The composer Manfred Stahnke (Hamburg), a former student of Ligeti, examined microtonality and hybrid tuning in some of Ligeti’s works, and Amy Bauer (University of California), the relationships between some keyboard works of Ligeti and the performing results and limits. Keith Potter (Goldsmiths University of London) presented some sketchbooks of Steve Reich, under the generic of "the minimal loop" – while Bianca Țiplea-Temeș (Cluj) questioned the position of the Romanian minimalist composers as "outside the loop", as they are originating their procedures in archaic sonorities. It is a fundamental difference of the Romanian to the contemporary Hungarian composers, who – as Anna Dalos (Musicology Institute Budapest) documents – were influenced by the American minimalists. Ligeti’s early minimalism investigated by Heidy Zimmermann (Paul Sacher Foundation Basel) also shows different sources as the American, which "he discovered during his residence at Stanford in 1972". An intimate parallelism study of Ligeti to Reich and Riley was made by Pierre Michel (Strasbourg), while Felix Meyer (Paul Sacher Foundation Basel) presented Ligeti’s essential parallels to Nancarrow. The very young and sagacious Vlad Văidean (a doctoral student at the National Music University Bucharest) treated "speech melody as technique and emotion" in different musical manifestations, reaching to Steve Reich. The "minimalism vs maximalism" as an aesthetic categorisation was the departure for a comparison Ligeti and Kurtág made by Pavel Pușcaș, while the minimalism in modern staging was the topic of Anca Mihuț (both of them, from the Music Academy Cluj. The book György Ligeti’s Cultural Identities, edited by Amy Bauer and Márton Kerékfy (Routledge, 2018), where Bianca Temeș is the author on a study about Romanian traditional music influences on Ligeti, was launched. In my opinion, the topic of Ligeti’s multicultural identities is open to being continued in several other studies. Then followed three evenings of very offering concerts in Cluj. The world-famous Amadinda Ensemble (Budapest; founded 1984) gave a concert with burn out effect to the listeners, including the professional-ones, due to their expressive intensity and the brilliant by heart performance. The programme (with works by Aurél Holló – Eliott Cole – Steve Reich on one hand and African and Tahitian traditional music adaptations on the other) mostly featured marimbaphones and vibraphones, along with dozens of different timbre colours, from yells or tree trunks to mouth harmonicas. In the centre of the recital was placed the cycle of Ligeti on poems by Sándor Weöres, "With Pipes, Drums, Fiddles" – with a perfect natural vocal artistry of mezzo-soprano Katalin Károlyi aside Amadinda. The "composer in residence" status started in the Ligeti Festival from Transylvania this year. The first chosen is Diana Rotaru (b. Bucharest, 1981) and the title of her author recital "Acrylic Self-Portrait in Sounds" fits perfectly to her music. Conceptualism aside romantic intensity, humorous and dramatic suggestions (including aspects of the couple relationships) expressed by cultural elements (like jazzy sounds or medieval allusions) compose the prominent identity of Diana Rotaru work – in which, as it can be stated, Ligeti "is also there". Poems by Edward Estlin Cummings, Marin Sorescu, and Federico García Lorca were ideally expressed in music due to the soprano Mihaela Maxim. The world premiere of Clouds, for violin and cello (a piece commissioned by the Festiva,; played by Vlad Răceu and Vlad Rațiu), suggested to me a contemporary replication to the baroque style of Heinrich Biber’s birds (2nd movement) and a tombeau with an alphorn-like lament of the cello (3rd movement). I also noticed the creativity of Diana Rotaru for an interesting ending of each of her pieces. The members of the Ad Hoc Ensemble (Cluj; founded 2009) – including now also a flute, a clarinet, piano, and percussion – did an excellent job, except some shyness in the vocal and motoric interventions in the instrumental theatrical moments. This program was also presented in Târnăveni, the natal city of Ligeti. 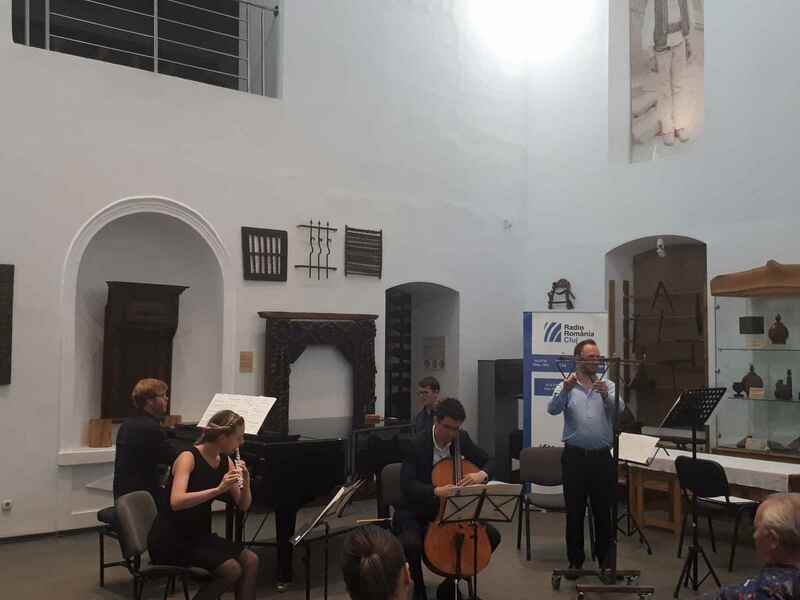 The last concert in Cluj included some works of the major contemporary composers originating from Transylvania: Ligeti, Kurtág, and Eötvös aside the newest Hungarian composers, such as Balázs Horváth (b. 1976) and Máté Balogh (b. 1990), unknown to our public. The Solo Sonata for Cello by Ligeti revelled the thesis-antithesis-synthesis Bach-pattern of its two movements based on melodicity (Dialogo) and, respectively, virtuosism (Capriccio), which recapitulation intertwines the previous contrasts – due to the excellent performance of Tamás Zétényi. Fourteen of the Játékok for piano by Kurtág were played by Peter Kiss, a convincing master of musical dramaturgy, of dynamics and colourful touch on the keyboard. I do not remember to have heard Eötvös played before in (also) his natal Transylvania... The works chosen for this occasion suggested aetheric evolutive thinking and vibration. The chamber works we heard by Balázs Horváth and Máté Balogh combine repetitive-transformational musical techniques and musical theatre elements so that the speculative procedures can give pleasant effects. The music played by Peter Kiss (piano), János Nevelő (percussion), Tamás Zétényi (cello), and Judit Nagy (flute) had a warm reception of the audience. 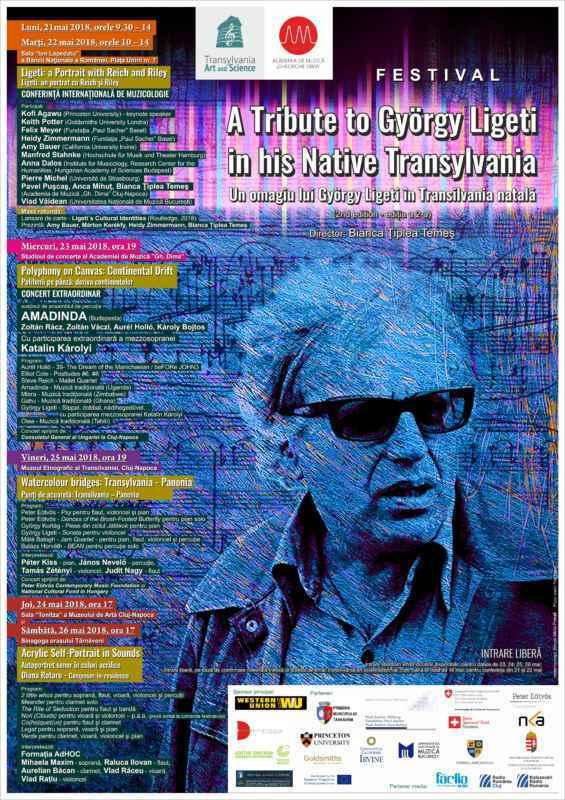 The second edition of the International Festival A Tribute to György Ligeti in his Native Transylvania remains, as well as the first, enlightening and exemplary! Cercetători din elita muzicologiei mondiale și românești au fost reuniți de organizatoarea Festivalului, Bianca Țiplea-Temeș, pentru a examina și discuta tematica minimalismului muzical, la Ligeti, Reich, Riley, Nancarrow, Kurtág, precum și la compozitorii contemporani maghiari (care urmează minimalismul american) și români (care adoptă minimalismul pornind de la sonorități arhetipale). A fost lansată cartea Ligeti’s Cultural Identities, având ca editori pe Amy Bauer și Márton Kerékfy (Routledge, 2018), unde Bianca Temeș publică un studiu despre influențe românești asupra lui Ligeti. Festivalul a inaugurat statutul de „compozitor-rezident” cu Diana Rotaru. Concertul său portret a fost realizat de Ansamblul Ad Hoc și a fost prezentat la Cluj și Târnăveni (localitatea unde s-a născut Ligeti, în 1923). Prima audiție absolută a piesei Clouds pentru vioară și violoncel, de Diana Rotaru, integrează sugestii baroce în texturile contemporane. Alte două concerte, desfășurate la Cluj, au oferit programe inedite pentru viața muzicală de la noi: Ansamblul de Percuție AMADINDA (Budapesta) și mezzosoprana Katalin Károlyi au adus un program în care Ligeti a fost flancat de minimaliști și de prelucrări de muzici tradiționale africane și tahitiene, redat, aproape integral, pe de rost. Fundația pentru Muzică Contemporană Péter Eötvös a adus la Cluj un recital în care Ligeti, Kurtág și Eötvös au fost alăturați cu nume noi din muzica maghiară: Balázs Horváth și Máté Balogh, cu replici umoristic-meditative în domeniul teatrului instrumental, recital realizat cu virtuozitate de interpreți maghiari. Bravo pentru Asociația Transylvania Art and Science, în parteneriat cu Academia de Muzică „Gheorghe Dima”!